How do you perform with excellence in ALL you do? What does it take to be a high performer, and to achieve success over the longterm? One thing that high performers have in common is the ability to raise psychological necessity. This is the act of priming your mind that makes doing a good job a MUST – not a preference. I detail the art and science of this habit in my new book High Performance Habits: How Extraordinary People Become That Way. Whether you want to be a great dad or a great mom, or you want to crush it in that next meeting at work, you’ll need to turn that goal into an absolute MUST. You’ll need to activate psychological necessity. Here’s how. #1. Associate your identity with success. If you want to be exceptional at what you’re doing, you need to put your identity at stake. Before you enter any situation where performance matters, you need to say, “I am a person who performs with excellence at this.” There’s risk there, right? What if you fall short? Well, that’s a risk that high performers take. Watch the video for how important this is! #2. Obsess over a topic. High performers are obsessive about mastering a topic. It’s more than just “passion.” Knowing the difference is important, so watch the video. #3. Connect with social duty. Find the people or purpose outside of you – like your family, wife, kids, team, or students – and fight for them. Ask yourself, “Who needs me to bring my A game right now? 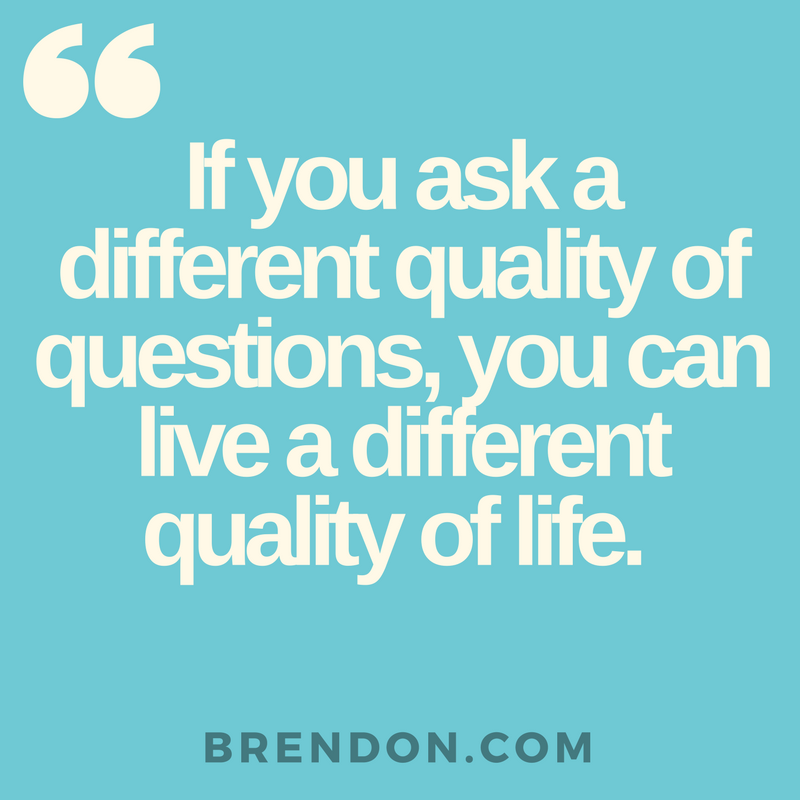 That’s a question high performers ask themselves constantly. #4. Set deadlines. This is a key ingredient of performance necessity. When you have real deadlines, you’ll watch your output soar. 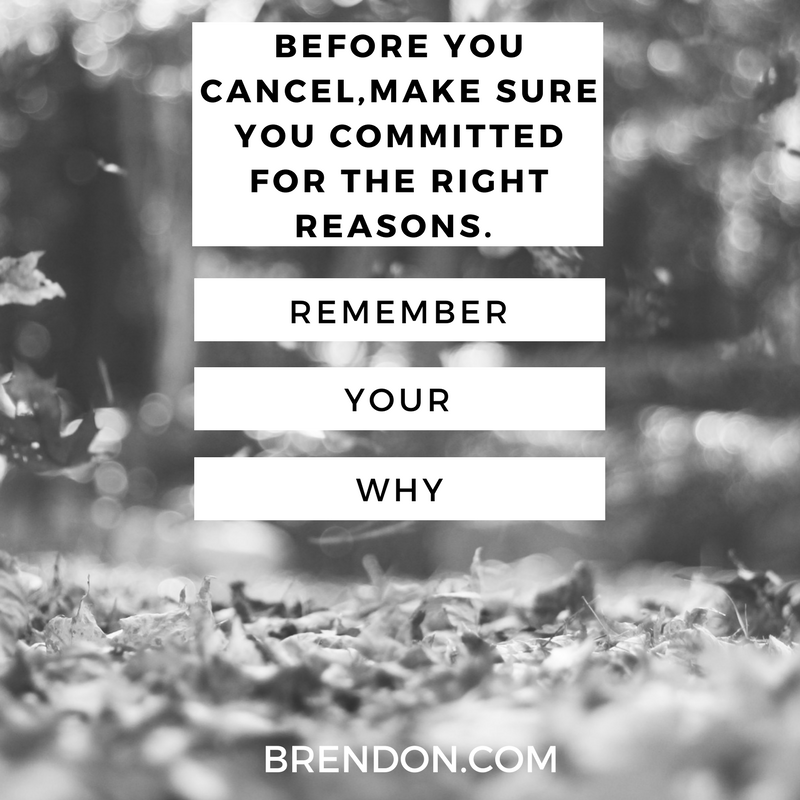 You need triggers to remind yourself of WHY this deadline is important. Read my new book for a full chapter on this. 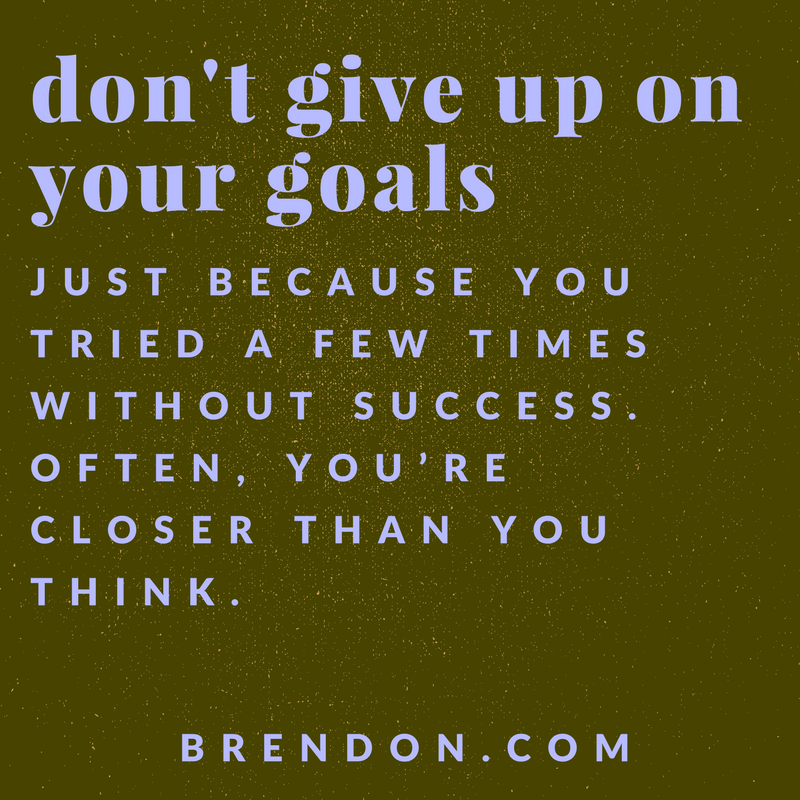 In this episode of #TheBrendonShow, I’m going to teach you a concept that is so important to your high performance: the ability to succeed over the long-term. It’s one topic, it’s one concept, and it kind of blew my mind. I’ve been teaching personal and professional development for 20 years of my life, and 10 years full-time teaching about high performance. We conducted the world’s largest study of high performers, and I learned one new concept, and I didn’t know how important it was. This concept is called raising your psychological necessity. That story explains the concept of performance necessity. Performance necessity is using your mind and priming your mind in a way that makes you doing a good job in that specific activity a must and not a preference. There’s a lot of things that people would like to do or want to do, but they don’t do it because the psychological necessity is not there. Meaning, it’s not necessary for them to perform well. It’s not necessary for them to excel or to win there, so they don’t. But what I found in this huge study was that high performers – to a T – all psych themselves up going into the major activities. If they’re walking into work that day, they proclaim, “I’m gonna crush it today,” and then they say things to themselves with their self-talk that make them crush it that day. That may sound like common sense. However, first of all, it’s not always common practice, and secondly, there’s distinctions that can help you learn from high performers. I talk all about it in my book High Performance Habits: How Extraordinary People Become That Way. So, how do you develop that kind of psychological necessity? For example, maybe you’ve wanted to lose some weight, but you didn’t because it wasn’t a must. How do we get you to that “must” category where your performance is so important. Whether that’s you becoming a great dad or a great mom, or it’s you crushing it in the next meeting, or you doing the sales video just right, or you doing your photo shoot and you show up in your best, amazing energy. Whatever you’re trying to do, how do you do it with exceptional excellence, with what we call high performance? What we know about high performers is that they’re able to achieve long-term success more than other people, and one of the primary reasons is psychological necessity. So let me tell you the four things that will help you develop psychological necessity. #1. Associate your identity with success. The reason it’s a must and not a preference for high performers is because high performers have allowed themselves to associate their identity with doing well in that specific thing. And that’s scary for most people. We don’t want to put our hearts and our minds and our identity all into something because we fear doing poorly or messing up. If you want to be a poker player and you say, “I’m a poker player and I’m being a world-class poker player,” and then you lose a bunch of games, there’s a lot of psychological risk there, right? Most people never go all-in with their identity to something because it’s scary. I remember when I became an author. Putting a book out there can be terrifying. When people ask what I do, I say, “Well, I’m a writer and I’m a trainer.” I remember the day that I owned that. “I’m a writer.” I literally remember the day I owned it, and embraced this as who I am and what I do. So now imagine when I go to launch a book, if that book didn’t do as well as I wanted, how bad I could feel. There’s risk there, right? But that’s a risk that high performers take. They’re allowing themselves to associate their identity with doing well in that specific area. I said to myself, “I’m going to become a great writer one day, I will do the research, and I will write lots of different styles.” So if you’ve ever read any of my books, they’re all different. Life’s Golden Ticket is different from Motivation Manifesto, which is different from The Charge, which is different from High Performance Habits. I’m doing that as a writer because I’m trying to get better. I’m willing to say that I’m a writer and I’m going to become excellent at it. And that’s why it’s important for me to write well. And here’s what high performers also do. They don’t always say, “It’s important to who I am “to do well here because it’s part of my identity,” when I talked with them in the interviews, they all said, “I can’t imagine doing anything else.” They all said it. “This is my thing, I love this thing, “it’s who I am, Brendon, to do this.” That’s why they’re succeeding at it. It’s who they are to do it. If it’s who you are to do it, then you don’t have to force it, it’s just who you are. You’re doing the thing that is who you are. You follow? That’s why they become high performers ’cause everyone else is faking it until they’re making it. They’re forcing it, and they’re not following who they are, they’re not congruent, right? High performers are doing what they feel is congruent to who they really are, and that’s why they outperform everybody else around them. And that’s just one element of psychological necessity we talk about in the book High Performance Habits. #2. Obsess over a topic. High performers allow obsession as well. They allow association with identity doing well, but they also allow obsession. All high performers tend to be obsessed with a topic. Dork out about it, geek out about it. They get obsessed. Osession is different from a passion. Passions are okay. The whole world wants you to be passionate, right? Live with passion, follow your passions, do your passions, be passionate at work. Passion is safe, passion is accepted, and passion is expected. But what’s the difference between a passion and an obsession? When you’re obsessed with something, people think you’re crazy. You know? When you’re passionate, they congratulate you. When you’re obsessed, they warn you. They say, “Wow, you’re spending too much time on that.” or “Why do you care so much about it?” They think you’re weird for liking it. That’s how you know the difference. Now, of course, there’s unhealthy obsessions. For example, when you do it and focus on it so much that you wreck a relationship, and you can’t stop thinking about it. It becomes so compulsive. High performers are obsessive about their topic, and what I mean by that is they’re obsessive about mastering that topic. They want to get good at it. A high performing chess player wants to master that game. They don’t want to just play the game, they want to be known for the game. They want to develop a high level of mastery at that. It’s the same thing in any other given genre. High performers always stand out because you can tell they do more research on it. They pay attention to their numbers. They want that feedback, why? They’re obsessed with getting better at that specific topic, so they do deliberate practice. We know this of high performers, that internally, they generate this necessity by saying, “This is who I am, and I love this topic so much that I’m going to obsess over it. #3. Connect with social duty. That’s just the internal game. There’s an external game of necessity, too. Sometimes you perform at your highest levels because you feel a sense of social duty, or social obligation, or even maybe spiritual purpose. Meaning, there’s something outside of you, so it’s not just your identity or what you like to do, or are obsessed with doing, it’s that there’s something that you feel called to do or obligated to do, and you do it because of that. You’ve probably heard that phrase that we’ll often do more for other people than we’ll do for ourselves. That comes true with high performers. When I interview them, they tell me that they’re doing it for their family, or wife, or their fans or students, or kids, or even the kids across the street. They want to be a role model for them. Or maybe their parents are struggling right now, and they know that they need to show up for them and bring their “A” game. Who needs you to bring your “A” game? That’s a question high performers ask themselves. That’s psychological necessity and external drive. Social duty, obligation, purpose, doing well for other people is a drive. #4. Set deadlines. 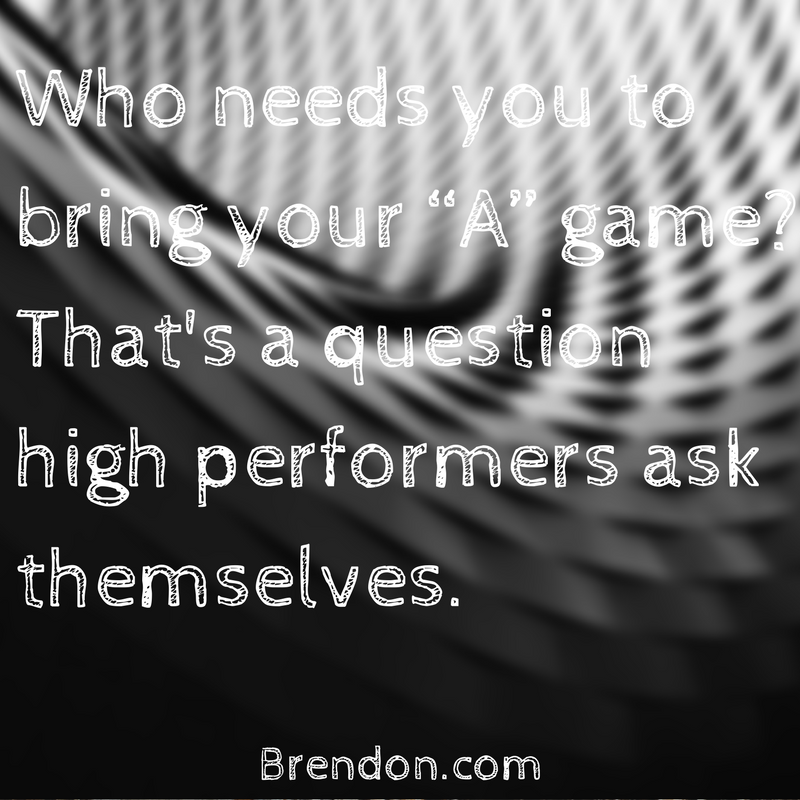 For High performers, it’s necessary for them to bring their “A” game because there’s usually an external deadline. Writing this book High Performance Habits took me three years of my life. Almost a million dollars in research spending went into this book. There’s 50 pages of cited reference material in the back. I read every one of those research studies. I read every one of those books. I obsessed about this myself. I am a writer. I wanted to get this book out to you guys. So I had all the components of necessity. Identity, yes! Good job! Obsession, oh I love this topic! Social obligation, duty, purpose, calling, I want to give this to you! And you know what? I wouldn’t get the book done because it wasn’t complete, necessity wasn’t complete until you hit me with a deadline. That last element, wham! As soon as I had that deadline, guess what happened? Output per hour increased. More pages were getting done because sometimes you need that external pressure. Maybe you don’t like it, no one likes being forced to meet a deadline. However, Olympians don’t choose when and where the Olympics are. CEOs don’t choose when and where the quarterly call or the meeting is. We don’t get to choose these things. Entrepreneurs don’t get to choose when, where and how much their customers are going to buy. We have to show up for others and to other people’s timelines in life sometimes, too. So here’s what high performers do. They remind themselves of the deadlines and the times, and why it is necessary, why there are consequences to doing it by then. And they psychologically give themselves that self-talk. 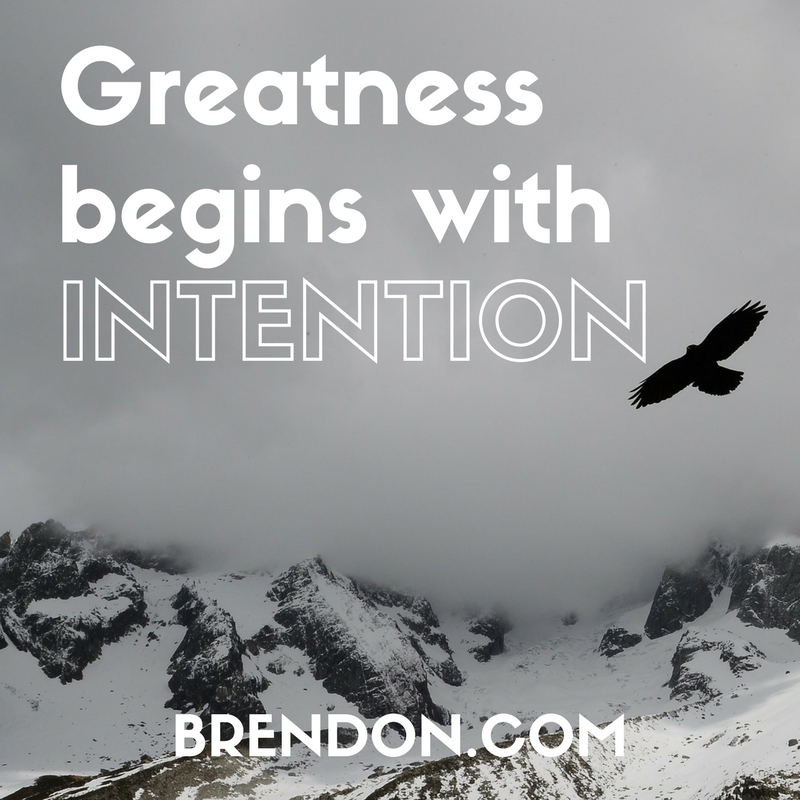 They say to themselves, “I need to get this done now, and here is why.” And being connected with that too is really important. I need to win this race at this stage of my career. I’m going to be better for my relationship right now at this stage of our marriage. They tell themselves about the timing and why it’s important to do well. So, how do you tie all this together? The next time you’re going to go do some important activity, whether that important activity for you is walking onto a stage, whether it’s putting a good PowerPoint together, whether it’s doing video, or whether it’s just being awesome in a meeting or your home life. Before you walk into the situation, raise your psychological necessity to be awesome in that situation. That’s your job. That’s your goal. This is what high performers do. Before they walk into that activity, they raise the necessity. I’m walking into this situation because I chose it. I want to be here. I want to deliver. I want to be great. I want to get better at it. Because I want to get better at it, I’m going to obsess about it. I’m going to pay attention to my progress. I’m going to take that feedback, and I’m going to improve. When these components come together more and more often for you, then what happens? You start achieving that necessity, that mindset of necessity, to become exceptional at what you do, and then, you do that over and over, and you get this tagline. How extraordinary people become that way? Extraordinary people become that way ’cause they choose to be that way. They choose to psych themselves up to deliver, to do a good job. They raise that necessity and because they raise the necessity, they raise their performance. They raise their performance, they change their lives, and they achieve long-term success. 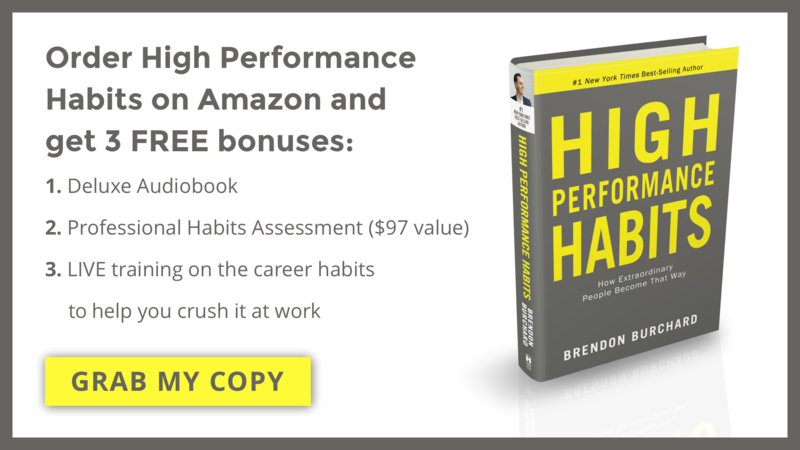 High Performance Habits: Audiobook Excerpts!